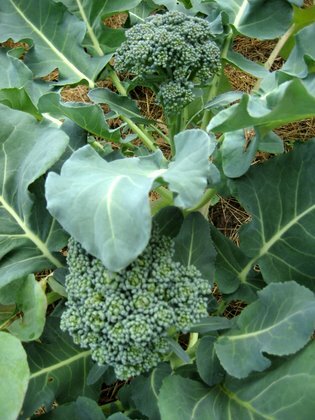 Reason #845 (if I were counting that is): it’s the first week of June and we had a monster harvest of broccoli for dinner last night. 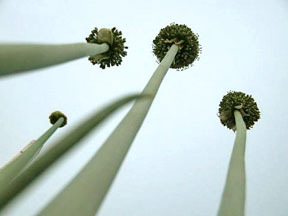 Granted, I feel like I only recently made an ode to the last of the greenhouse broccoli…I figured it would be a while before we supped again on its crunchy green spears. Nope! I planted these babies under the lights in the basement on Feb. 23rd, then out into the greenhouse in March, then into the garden at the end of April. And this, when all that’s ready out there are onions, salads, asparagus and flowers on my peas: great, but nothing that sticks to the ribs, you know? Perhaps broccoli is a symbol of my vegetarian past. It’s entirely possible it holds my esteem so readily because I have eaten so much of it over the years. But I do swear that transferring things from a little pot to real dirt in the greenhouse, and not some half-step single pot still under the basement lights, makes all the difference. You know how plants love rainwater much more than water from your hose? I swear the microbes in the soil and the light of the sun in the greenhouse are manna from heaven to them. But back to the broccoli. I will continue to harvest these guys until mid-July. I will then direct sow new seeds in the beds for a fall harvest. I will then sow more seeds in mid-August, transferring these babies into the greenhouse in October for winter eating. I do agree one must eat seasonally…but I swear broccoli (and raab, and Chinese broccoli, and flowering turnips…) are just as big a staple around here as potatoes! Yum. This entry was posted in food, greenhouses. Bookmark the permalink. Evertime I stop by here I’m hearing about that greenhouse! Yep, I think I might have to get one of those. Especially with all those good vegetables. We’re on our way to a pretty decent broccoli harvest—the row covers kept out the cabbage moths, which devoured the entire crop last year. Am I remembering correctly that the plants will put up baby heads after you take off the initial head? Broccoli heads are delicious but those leaves are also marvelous to eat. Not as much textural fun as the flowers but more vitamins + minerals. Did I say yum? My favorite pizza is broccoli – spread the thickly crust w/ pesto instead of tomato sauce, add lots of blanched broccoli, pine nuts and goat cheese, bake until done. HEAVEN. I buy broccoli year-round at the farmers market out here in SF, it’s good to know I’ll be able to grow it year ’round in MI. Still – here it’s at its best in Nov-December. SWEET. I’m really excited – will spend next week on my SW MI property, camping. Robin, what’s up with those chickens of yours, or rather the coop? Yep: you should put a greenhouse on your list too. Just think of all the ornamentals you can cultivate, besides just the lowly foodstuffs! Meg: Righto, or rather, most of them do (hybrids built for one big head sometimes are one-hit wonders). The newer harvests will be small heads but they should be great. I’ve had cabbage moth problems too but mostly it’s a timing issue: they’re problems later in the summer for sure. I hope the reemay helps you. It’s such great stuff, really it is! Nada: you are so right! I also go a little nuts for other cole crops that flower, even though we usually just eat the leaves of them. Kohlrabi and kale flowers made it into the saute pan this year too. Great point about the brassica family, they’re meant to be eaten, moreso than so many other plants!